This page on the Department for Transport web site is an interactive map of the Abellio’s promises for East Midlands Railway. These trains are proposed for working on several routes and some of their features are given. In this section, I will try to ascertain, what they will be like. These trains will replace the interim Mark 4 Coach/Class 43 locomotive sets on the Midland Main Line from April 2022. They will also be used on the following services. I think it wouldn’t be speculating too much, to expect that shorter versions of these trains would also be used on other routes of the franchise. I also think, that these trains will have other properties. Bombardier, Hitachi and Stadler are proposing or have built fast bi-mode trains, which run at the same speed on both diesel and electric power. Bombardier are proposing a 125 mph Aventra with batteries. Hitachi’s 125 mph Class 800 trains are running at 125 mph on electric power, but can they achieve the 125 mph on diesel needed for the Midland Main Line? Stadler’s 100 mph Class 755 trains, will be running between London and Norwich at this speed from next month. As parts of the Midland Main Line, that will not be electrified by 2022, to have a 125 mph operating speed, it is essential that the trains can do this speed on either power source. Some trains do this, but others don’t! To run as fast a timetable as possible, it is essential. Hitachi’s Class 800 trains can do it! The notes on the interactive map, says that Corby services will be this length in the Peak. 240 metre long platforms will be needed at St. Pancras for Corby services. Thameslink services are already this length. These points lead me to the conclusion, that the new bi-mode trains can be up to 240 metres long. A seven-car Class 222 train has the following properties. As the interiors of the existing and proposed trains seem similar with lots of tables and comfort, adjusting for the longer bi-mode train gives the following numbers of seats. There will be a large increase in the number of seats. Stadler are the masters of this and are providing it on Merseyrail and on the Great Eastern Main Line. Other companies will have to follow suit! Hitachi in particular and surprisingly seem to design their trains with a big step. This picture shows the step up into a Class 395 train at St. Pancras station. It is unacceptable! 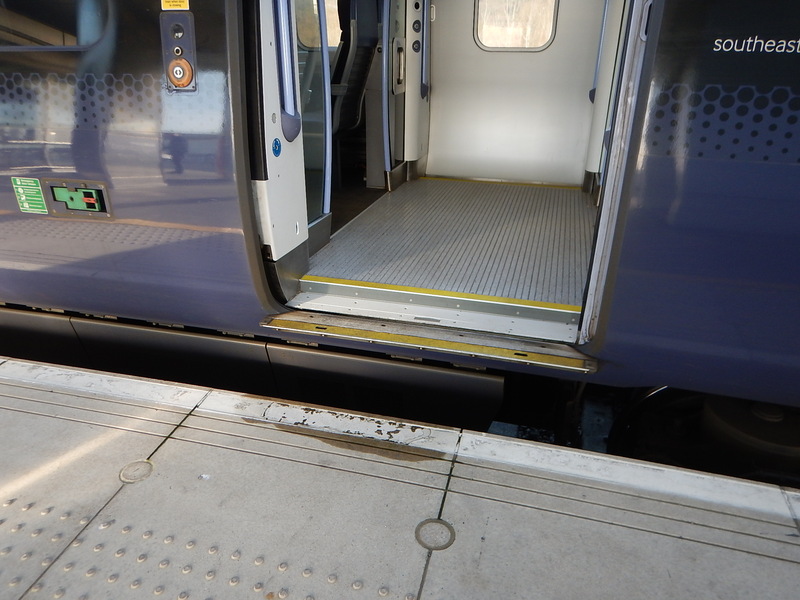 Step-free access improves the dwell time of trains at stations and is essential on any high-frequency service. IDigital signalling could even enable 140 mph running on sections of the route. The performance of these trains and easy access, will mean that every station stop will be faster and will enable two pssenger benefits. Journeys will be faster by a few minutes. It will be possible to add extra station stops, with only a small penalty of overall journey times. I doubt passengers will be unhappy. High Speed Two should reach the East Midlands Hub station in 2032 and Sheffield station in 2034. Between Clay Cross North Junction and Sheffield, High Speed Two and Midland Main Line services will use the same sixteen mile electrified railway. Good project management probably says that this joint electrified line is created early, by say 2025. This would obtain maximum benefit to the City of Sheffield and the surrounding area. As it is likely, that the new bi-mode trains will still be in service to past 2034, whatever is decided, these bi-modes must be able to run on High Speed Two infrastructure. Even if, the current service pattern of two trains per hour to Derby, Chesterfield, Nottingham and Sheffield is maintained, there will be a large increase in capacity. But if a fully-digital railway is created with 125 mph trains, I can see the Midland Main Line becoming one of the finest high speed railways in the world, that has been created by updating a classic rail line built in the Nineteenth Century. Operating speed and capacity will be up there with the East Coast and West Coast Main Lines. I can see Derby, Nottingham and Sheffield having a four trains per hour service from London in times of 75, 90 and 120 minutes respectively. By comparison, High Speed Two is looking at a sub-ninrty ,minute time between London and Sheffield. The title of this post is the same as that on this article on Sky News. The Department for Transport has confirmed it is actively working with a number of groups to explore the possibility of reopening old rail routes, axed under the so-called Beeching cuts of the 1960s. It follows a call by Transport Secretary Chris Grayling a year ago, encouraging those in the public and private sector to submit proposals for potential projects to regenerate old lines. It also quotes a Department of Transport spokesman. He apparently, didn’t say more because of confidentiality. The article then talks about the success of the Borders Railway in Scotland. So is this just a good news story for Christmas or is there a plan to reopen old railway lines? I feel that a several factors are coming together, that make the reopening of railway lines and the creation of new ones more likely. Signalling is expensive, but where you have rolling stock to a high modern standard, with digital in-cab signalling, does this mean that new or reopened rail lines can be built without conventional signalling? In addition, installing digital signalling on some routes, would probably make it easier to add a new station. Surely, it must just be a reprogramming of the route! It could be a problem that, I would expect that on a digitally-signalled line, all trains must be capable of using it. But in many areas of the country, like East Anglia, these routes will be run by new trains. Digital signalling must also make it easier to design more efficient single-track railways, with perhaps a passing loop to allow higher frequencies. Network Rail and their contractors and suppliers are getting better and more efficient at building track and bridges through difficult terrain and places, judging by some of their construction in recent years, such as the Acton Dive-Under and the Ordsall Chord. They have also overseen some notable successes in the refurbishment of viaducts and tunnels. It should also be noted that the reopening of the Borders Railway was a successful project in terms of the engineering and was completed on budget and on time. According to Wikipedia, though there was criticism of the infrastructure. The line’s construction has been described as resembling a “basic railway” built to a tight budget and incorporating a number of cost-saving features, such as using elderly two-carriage diesel trains and running the line as single track. But looking back on the line from over three years since it opened, it has certainly been judged by many to be an undoubted success. Would it have had the same level of success, if it had been built as a double-track electrified railway? The Borders Railway is a good example of an efficient single-track railway, that runs a half-hourly service. Other routes like the East Suffolk Line and the Felixstowe Branch Line, show how good design can handle more than the most basic levels of traffic, with perhaps selective double track or a well-placed passing loop. They may be dismissed by rail purists as basic railways, but when well-designed, they are able to provide the service that is needed along the route, for a construction cost that is affordable. I would though advocate, that if a new single-track railway is built, that provision is made where possible to be able to add the second track. But not at too great an expense or to provide a service level that will never be needed. I believe that good design of a new railway can cut the construction cost by a fair amount. Several of the new stations built in recent years have been stations with only a single-platform. Cranbrook – A station in Devon on the West of England Main Line to serve a new housing development. Ebbw Vale Parkway – A parkway station in Ebbw Vale. Galashiels – A station, that handled 356,000 passengers last year. It is a unique station on a narrow site, that shares facilities with a large bus station on the other side of the road. It is a very functional transport interchange. James Cook – A basic but practical station, that serves the hospital in Middlesbrough. – It cost just over £2million in 2014. Newcourt – A £4million station handling over 100,000 passengers per year. Pye Corner – A basic station in Newport handling nearly 100,000 passengers per year. The stations have several common characteristics. They can all handle at least a four-car train. The single-platform is used for services in both directions. Disabled access is either level or by a gently-sloping ramp. Only James Cook station has a footbridge over the track. These single-platform stations must cost less, as for instance a footbridge with lifts costs upwards of a million pounds. Note that of the nine stations on the Borders Railway only three have two platforms. There are also several terminal stations in the UK with only one platform. Aberdare – Handling over 500,000 passengers per year. Aberystwyth – Handling around 300,000 passengers per year. Alloa – Handling around 400,000 passengers per year. Aylesbury Vale Parkway – Handling over 100,000 passengers per year. Blackpool South – Handling over 100,000 passengers per year. Exmouth – Handling nearly a million passengers per year. Felixstowe – Handling around 200,000 passengers per year. Henley-on-Thames – Handling around 800,000 passengers per year. Marlow – Handling nearly 300,000 passengers per year. Merthyr Tydfil – Handling around 500,000 passengers per year. North Berwick – Handling around 600,000 passengers per year. Redditch– Handling over a million passengers per year. Seaford – Handling over 500,000 passengers per year. Shepperton – Handling around 400,000 passengers per year. Sheringham – Handling around 200,000 passengers per year. Windsor & Eton Central – Handling nearly two million passengers per year. Many of these stations have only a single hourly train. whereas Redditch and Windsor & Eton Central stations have three trains per hour (tph). As a single terminal platform can probably handle four tph, I suspect that most terminals for branch lines could be built with just a single platform. Chris Grayling has said that the East West Rail Link will be built without electrification. Network Rail has a very poor performance in installing electrification. There have been complaints about the visual intrusion of the overhead gantries. Electrification can cause major disruption to road traffic during installation, as bridges over the railway have to be raised. When the Borders Railway was reopened, unless the line had been electrified, it had to be run using diesel trains. But in the intervening three years, rolling stock has developed and now a new or reopened railway doesn’t have to be electrified to be substantially served by electric trains. Bi-Mode trains are able to run on both diesel and electric power and Hitachi’s Class 800 trains are successfully in service. They will be shortly joined by Porterbrook’s innovative Class 769 trains. Hydrogen-powered trains have already entered service in Germany and they are being developed for the UK. Battery-electric trains have already been successfully demonstrated in the UK and will enter service in the next few years. All of these types of train, will be able to run on a new railway line without electrification. Bi-mode trains are only low-carbon on non-electrified lines, whereas the other trains are zero-carbon. The trains on the Borders Railway must be prime candidates for replacement with hydrogen-powered or battery-electric trains. Adding up the factors I have covered in this section leads me to conclude that rail developments over the last few years have made it possible to create a new railway line with the following characteristics. An efficient mainly single-track layout. A single-platform terminal station capable of handling well upwards of a million passengers per year. Service levels of up to four trains per hour. Low levels of visual and noise intrusion. The new railway will also be delivered at a lower cost and without major disruption to surrounding road and rail routes. There is a very large demand for new housing and other developments all over the UK. Several proposed rail projects are about connecting new developments with the rail network. In London Overground Extension To Barking Riverside Gets Go Ahead, I listed a few developments in London, where developers and their financial backers, were prepared to put up around £20,000 for each house to fund decent rail-based transport links. Obviously, developments in London are expensive, but with all the new developments, that have been built close to stations in the last few years, I suspect that infrastructure financiers. like Legal and General and Aviva, know how much being by a rail station is worth. Both public and private infrastructure financiers will take advantage of the good railway and rolling stock engineering, which will mean the necessary rail links to new developments will be more affordable and zero-carbon. The title of this post is the same as that of this article on Railway Gazette. There are some, who believe that all trains should run on electrified lines. But my belief is simpler – All trains should be electric, but they might be able to run on tracks with or without electrification. There are currently, four proven ways to provide traction power on board an electrically-driven train. Stored energy – Battery and/or capacitor. Each have their advantages and disadvantages. Talgo who are on the short list to build trains for High Speed Two, already make a train called RENFE Class 730, which has the following specification. High Speed Two is designed for 225 mph running, so the trains would need to be faster than these. But suppose a train was to run say between Euston and Holyhead or any important place a hundred miles or so from High Speed Two. It would be unlikely that the last part of the route without electrification, would be a high speed line, with a maximum speed in excess of 125 mph. If it were a high speed line, then it would probably be electrified. So a typical specification for a bi-mode for High Speed Two would probably be something like. Maximum speed of 225 mph on High Speed Two using the electrification. Maximum speed of 125 mph on the alternative power source. Ability to go between at least Crewe and Holyhead (84 miles) and back without refuelling. Effectively, the train has two performance regimes; one for electrified high speed lines and one for classic lines without electrification. Eurostar’s Class 374 train, which is one of the latest high speed trains is described like this in Wikipedia. The Velaro e320, named because of plans to operate at 320 km/h (200 mph), would be 16 cars long, to meet the Channel Tunnel safety specifications but would have distributed traction with the traction equipment along the length of the train, not concentrated in power cars at each end. Distributed power gives better acceleration and smoother braking. The trains also appear to have at least six pantographs, so does that mean that each feeds a number of cars? I suspect there will be an electrical bus running the length of the train which will feed the traction motors. In my design of train, each car would have batteries and/or capacitors to handle the regenerative braking. The energy storage would give the train a limited range away from electrification. For the required range between Crewe and Holyhead, there would probably be a need for diesel or hydrogen power. I feel though, that in this day and age, no-one would build a new train that used diesel, if they could get the performance from hydrogen power or some other clean source. Perhaps one of the middle cars of the train could be a power car fuelled by hydrogen. This should be something that works, as British Rail and Stadler have both used this layout successfully. On What Routes Would The Train Be Used? I have used the service between London and Holyhead as an example and this is probably the longest route away from High Speed Two. Any route that is in range from High Speed Two or a connected electrified route, could be served by these trains, if it was so desired and the train could be run on the route. I wouldn’t be surprised to see one of these trains have the capability to go as far North as Aberdeen and Inverness. Bi-mode high speed trains could be designed, if anybody needed them. But for short extensions from High Speed Two, energy storage would probably suffice. This post puts together my thoughts on 125 mph bi-mode trains from other posts in the last couple of months. Yesterday, I had my first ride in a Class 800 train. I went from Paddington to Swindon in two-five car trains, working as a ten-car formation. The train was doing 125 mph for substantial parts of the electrified route. On the sections without electrification, a lot of the running was over 100 mph. I didn’t notice any noise or vibration from the diesel generators. As only, three-cars of a five-car train have them, I may have been in a car without a diesel generator. The Class 800 and its similar siblings are the nearest we have to an ultimate bi-mode train. Hitachi’s trains do not yet have the ability to cruise at 125 mph on diesel, but they will get closer in the next few years. I cover this fully in Do Class 800/801/802 Trains Use Batteries For Regenerative Braking? In the related post,I include this schematic of the traction system. Note BC which is described as battery charger. The diagram came from this document on the Hitachi Rail web site, which has the following description. The system can select the appropriate power source from either the main transformer or the GUs. Also, the size and weight of the system were minimized by designing the power supply converter to be able to work with both power sources. To ensure that the Class 800 and 801 are able to adapt to future changes in operating practices, they both have the same traction system and the rolling stock can be operated as either class by simply adding or removing GUs. On the Class 800, which is intended to run on both electrified and non-electrified track, each traction system has its own GU. On the other hand, the Class 801 is designed only for electrified lines and has one or two GUs depending on the length of the trainset (one GU for trainsets of five to nine cars, two GUs for trainsets of 10 to 12 cars). These GUs supply emergency traction power and auxiliary power in the event of a power outage on the catenary, and as an auxiliary power supply on non-electrified lines where the Class 801 is in service and pulled by a locomotive. 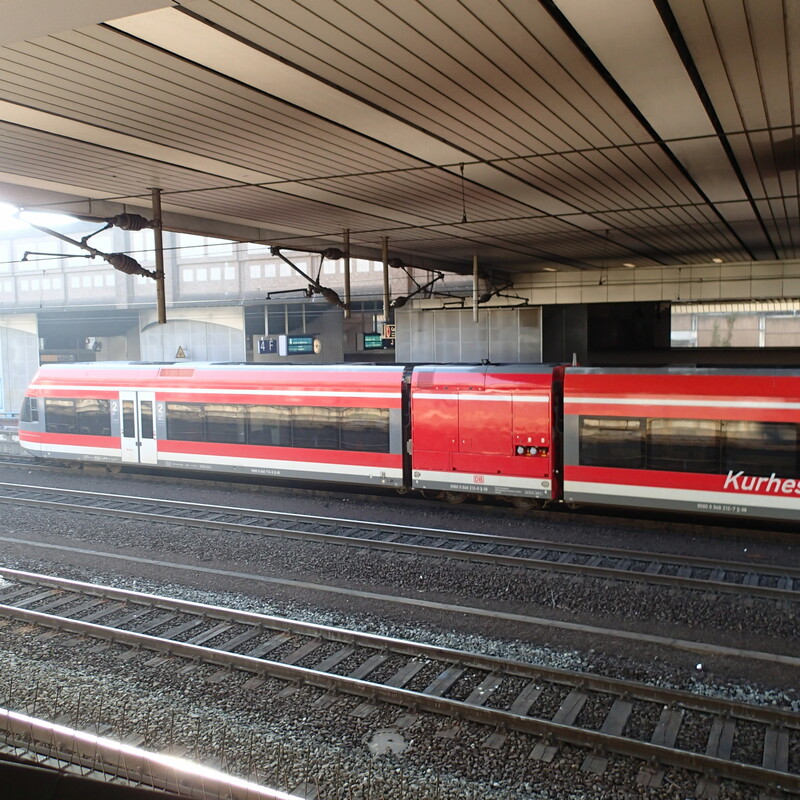 This allows the Class 801 to operate on lines it would otherwise not be able to use and provides a backup in the event of a catenary power outage or other problem on the ground systems as well as non-electrified routes in loco-hauled mode. This is all very comprehensive, but it doesn’t say anything about batteries, except that the auxiliary power supply incorporates a battery charger. It would appear the batteries might be used to provide emergency power, but the document doesn’t say, if they can be used as traction power. I suspect that in the next version generator units (GUs), and batteries will work together to make a more efficient train, that can use braking energy for traction. Using batteries in this way, means that regenerative braking is available in both electric and diesel modes. Note how in the above extract, it states this. On the other hand, the Class 801 is designed only for electrified lines and has one or two GUs depending on the length of the trainset (one GU for trainsets of five to nine cars, two GUs for trainsets of 10 to 12 cars). This will be very handy for short diversions or when the electrification fails, to get the train to the next station. Ability To Split And Join Automatically. This is an extract from the document on the Hitachi Rail web site. Because the coupling or uncoupling of cars in a trainset occurs during commercial service at an intermediate station, the automatic coupling device is able to perform this operation in less than 2 minutes. It is fascinating to watch the closely related Class 395 trains do this at Ashford International station. The document on the Hitachi Rail web site, explains in detail, how the train’s computer works out what coaches have been coupled together, to create the actual train. It even automatically adjusts everything if two trains are split or joined together. On my short ride, I didn’t notice the noise of the diesel engine, but on a first look, it appears to be acceptable. As I didn’t notice the change to diesel, somewhere past Didcot Parkway station, I must assume, this can be done at line speed. I feel that the next generation of these trains will be more advanced and efficient, and will be capable of 125 mph on both electrification and diesel. There are several roues, where a 125 mph bi-mode train could be an ideal train to serve the route. This is a route, that I wouldn’t have thought about, as it is electric-only until I read a short article in Edition 849 of Rail Magazine, which was entitled Call For ETCS On King’s Lynn Route, which advocated the following for the route. Modern digital signalling, which would include ETCS. These would increase the capacity South of Hitchin on the East Coast Main Line and make timetabling of the Fen Line much easier. Then in the next edition of the magazine, there was an article, that advocated the reopening of the King’s Lynn to Hunstanton branch line. At just fifteen miles this would be ideal for bi-mode trains or ones with sufficient battery capacity. There are other routes, which feature the following. 125 mph running on a high speed line, which is fully or partly electrified. An extension on a branch line without full electrification. A few example routes include. The new East Midlands franchise for the Midland Main Line will go the 125 mph bi-mode route. The InterCity 125 trains don’t meet the disability regulation after December 2019. No more electrification will be added to the route in the next few years. The Department for Transport says this in this consultation on their web site, about the new franchise. The new franchise operator has a key role to play in facilitating the delivery of new infrastructure and delivering the benefits the investment is funding, including the benefits delivered to passengers through a modern fleet of bi-mode trains. Bi-modes will deliver passenger benefits sooner than electrification would without the disruption from putting up wires and masts along the whole route. But some improvements should be completed by December 2019. The route will be electrified from St. Pancras to Kettering and Corby. The route will be four tracks from St. Pancras to Glendon Junction, where the Corby branch leaves the Midland Main Line. The overhead line equipment South of Bedford will be upgraded to allow 125 mph running. Bi-mode trains capable of 125 mph, would appear to be a necessity of running the Midland Main Line efficiently. his is a key section of the article. But now, in a letter to the Railway Industry Association (RIA), Grayling has finally confirmed that the TransPennine upgrade will be a “rolling programme of enhancements,” including both major civil engineering projects and electrification. He wrote: “The key to delivering improved journey times on what is a very circuitous route through the Pennines involves rebuilding and relaying most of the track bed from Manchester to York. If nothing else Chris Grayling’s comments appear to have been measured ones and not a quick response to ht out to shout down the various groups for whom nothing short of full electrification is an acceptable solution. There are three main routes across the Southern section of the Pennines. From North to South they are. The Calder Valley Line from Manchester Victoria and Preston in the West to Leeds, Selby and York in the East via Hebden Bridge, Halifax and Bradford. The Huddersfield Line from Manchester Airport, Piccadilly and Victoria in the West to Leeds, Hull and York in the East via Stalybridge, Huddersfield and Dewsbury. The Hope Valley Line from Manchester Piccadilly in the West to Sheffield in the East. The three routes are much of a muchness with operating speeds in the region of 70-90 mph. There are good connections in the West with Blackpool, Chester, Liverpool and the West Coast Main Line. There are good connections in the East with Hull, Newcastle, York and the East Coast Main Line. Some connecting routes like the East and West Coast Main Lines are electrified 125 mph routes, but others like the connections to Chester, Hull and Scarborough are slower diesel routes. Some electrified routes like Liverpool to Manchester via Chat Moss, although they are electrified need speed improvements. The four major cities served by the three cross-Pennine routes; Leeds, Liverpool, Manchester and Sheffield all Have sizeable local tram or rail services. If all these routes could be improved, they would create a core network of cross-Pennine routes. There is also two other secondary routes that could be improved or created as diversion routes, whilst work is carried out on the main routes. A conductor pointed out to me, that passenger trains can go between Blackburn and Leeds via the Ribble Valley Line and Skipton with a reverse at Hellifield station. And then there’s the reopening of the route between Sklipton and Colne, which appears to be top of a lot of politicians and train companies lists. Surely, these could be used to provide extra capacity if one of the Calder Valley or Huddersfield Lines was closed for improvement. Some suggestions, I’ve seen about the Skipton to Colne Line, even say it could be used for freight. I believe that with some measure of careful planning, the number of train paths across the Pennines can be increased, to an extend that would ease the improvement of the three main routes. The biggest upgrades of a UK railway in my time has been the electrification of these three main lines from London. West Coast Main Line, which was modernised and electrified by British Rail in the 1960s and 1970s. East Coast Main Line, which was electrified by British Rail in the 1980s. Great Western Main Line, which has been undergoing a tortuous and expensive upgrade and electrification for several years. So how did Network Rail mess up on the Great Western, when British Rail completed the other lines without massive amounts of trouble? Various reasons have been put forward, but I believe it has a lot ot do with the change of attitudes on the public’s behalf and new regulations in the intervening forty years. As an example consider the electrification of the Grade II* Listed Digswell Viaduct in the 1970s. British Rail just did it and I don’t even know, if there were any objections. Today, the Heritage lobby and various other pressure groups, would have had a field day. In the 1970s, most people accepted that the Government and Bitish Rail knew best. Forty years ago, passengers accepted the disruption caused by works on the railways. Now they don’t and there are millions more regular travellers to complain. Upgrading the main routes across the North have a lot of problems that will rear their ugly heads as the routes are upgraded. Many of the routes are double-track lines hemmed in by cuttings, villages and towns. 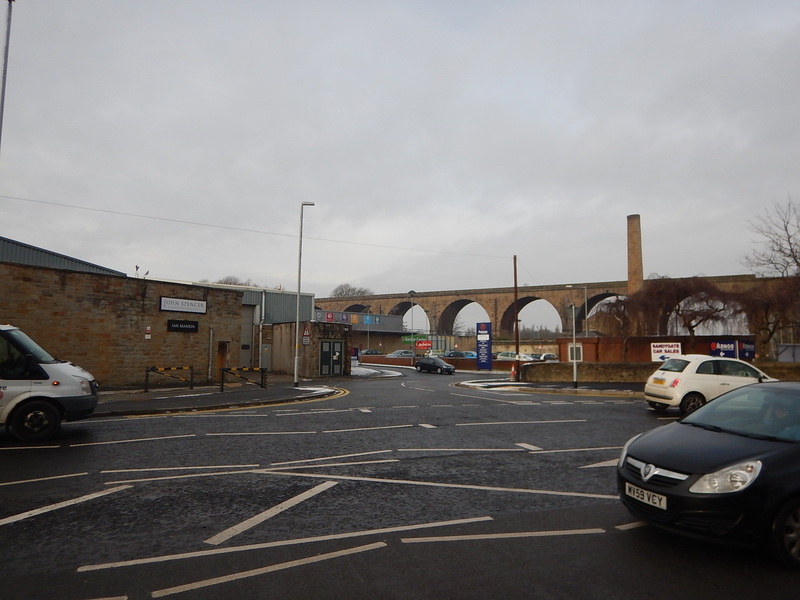 There are large numbers of bridges, viaducts and level crossings on the routes. Many of the routes have speed limits around 80 mph. How good is the documentation of the routes? Sitting in the middle of the routes is the Grade I Listed Huddersfield station and the Grade II Listed Hebden Bridge station. To see the problem of these lines take the following trains. Take a break at the three intermediate stations. Hebden Bridge station is a gem of a Victorian station. Leeds is a modern station overflowing with passengers. Huddersfield station is one of the North’s great buildings. In addition, note the number of arched stone bridges, that are probably not high enough for electrification. To upgrade and electrify these lines is not the simpler project of say electrifying the Midland Main Line, where much of the route is in flat open country. If ever there was a project, where one method doesn’t fit all, then this is that project. Every sub-project of the work must be done in the best way for that sub-project. Decisions must also be taken early, about factors that will influence the overall project. I believe that Crossrail and the new South Wales Metro were designed using an holistic approach. New trains have been designed in conjunction with the route. Electrification has been simplified by innovations, like batteries on the trains. Trains and platforms will fit each other. Station design has evolved for efficient train operation. Signalling will be digital to allow higher frequencies. Because of the complexity and importance of the overall TransPennine project, only the best solutions will do! Some will definitely not be invented here! A few of my thoughts follow! This would be a good idea, as improvements can be done in what is the best order for all the stakeholders. For instance there might be a bridge that will need to be replaced because it is too low and/or structurally, it is approaching the end of its life. But it will cause massive disruption to replace. On the other hand once replaced it might cut perhaps ten minutes from journeys passing through, as the track can be straightened. Perhaps it will be better to bite the bullet and get this project done early? In the past, I feel Network Rail has often delayed tackling difficult projects. But if they did a good on-time job, it might help to convince people, that they mean what they say in future. I said earlier, that Chris Grayling wrote this. The key to delivering improved journey times on what is a very circuitous route through the Pennines involves rebuilding and relaying most of the track bed from Manchester to York. No building, no matter how humble or grand can be built without sound foundations. What Chris Grayling said would be a good way to start the project. It would give the following benefits. Operating speeds might be raised in places. Important loops and crossovers, that have been needed for decades could be added. Structures like bridges, past their useful life could be replaced. Some level crossings could be removed. If it were done thoroughly, passengers would see reduced journey times. The new rolling stock that is already on order for the route would be able to work the various TransPennine routes when they are delivered. At the end of the work, Network Rail would also have a fully-surveyed railway in tip-top condition. It is my belief that to electrify a new or well-surveyed rebuilt existing railway, is much easier than electrifying an existing route. If parts of the improved route are to be electrified, it would be like electrifying a new railway. These points should be noted. Old mine workings and other Victorian horrors were found, when trying to electrify through Bolton. On the Gospel Oak to Barking Line in North London, they found an undocumented sewer. To sort out the electrification between Preston and Blackpool, Network Rail shut the route and rebuilt the railway before electrifying it. A similar approach to Preston and Blackpool might help on sections of the main TransPennine routes. It may be a more expensive process with all the surveying and rebuilding, but it would appear to a more safety-first approach. I’d be very interested to know how many of those bridges could be handled using discontinuous electrification. The wires go through the bridge in the normal way, but the section under the bridge that possibly could be a safety hazard, is earthed so that there is a dead section of wire. The section is insulated from the 25 KVAC wires on either side by something like a ceramic rod, so that the trains’ pantographs can ride through easily under the bridge. The disadvantage is the trains need batteries for power, where there is none coming from the overhead wire. The technique has already been earmarked for the electrification of the South Wales Metro. Crossrail and the Severn Tunnel do not use conventional electrification. A rail is fixed in the roof and the pantograph runs on the rail. The TransPennine routes have numerous tunnels and I believe that many could be electrified in this way. It might even be possible to automate the process, as it was in the Crossrail tunnels. But they were modern concrete tunnels, not Victorian ones with uneven surfaces. On the other hand there are a lot of old tunnels in the UK, that need to be electrified. I can’t understand why, viaducts like these aren’t electrified using a third-rail. Third rail electrification works for most applications as well as overhead. Working on overhead electrification on a viaduct, is not a job for some. There is no visual intrusion with third rail. The power could only be switched on, when a train is connected. On the other hand dual-voltage trains, that could switch quickly between systems at line speed would be needed. I also think that third-rail electrification can be used in stations where overhead electrification would be difficult or intrusive. Train manufacturers are not stupid and want to increase their profits. Alstom are developing fleets of hydrogen trains. Bombardier are developing 125 mph bi-mode trains with batteries. CAF are developing battery and bi-mode trains. Stadler are developing trains with batteries and/or diesel power. I suspect all these companies and others, see more trains can be sold, if innovative trains can run without the necessity of full electrification. I also suspect many rail operators would prefer to spend money on shiny new trains, than on disruptive and ugly electrification. Remember too, that batteries will improve. I can see several techniques that could be applied to make electrification of some parts of the TransPennine routes. Over a thousand Stadler Flirts have been sold to operators around the world. Most have been or will be built in Switzerland. The first fleet in the UK, comprise fourteen three-car and twenty-four four-car Class 755 trains for Greater Anglia. This visualisation shows a Class 755 train in Greater Anglia livery, running through the typical flat lands of East Anglia. These trains will enter service next year. They can run on 25 KVAC overhead electrification. They have a diesel power-pack, which can have up to four Deutz diesel engines, for running on lines without electrification. The three-car trains have two diesel engines and the four-car trains have four engines. They can change power source at line speed. Length is easily changed, by adding or removing cars. Three-car Flirts have 166 seats and four-car Flirts have 224 seats. They are designed to handle two-hour plus journeys, like Lowestoft to London for Greater Anglia. I suspect they are fairly powerful trains and I wrote about this in Greater Anglia’s Class 755 Trains Seem To Have Bags Of Grunt. Comparing the trains with a Class 170 train, I said this. But the four-car Class 755/4 trains have fifty percent more power per car, than the Class 170 train, so these will be no sedate rural trundlers. I’m certain, that their performance, will allow them to mix it on the Great Eastern Main Line with the London-Ipswich-Norwich expresses. 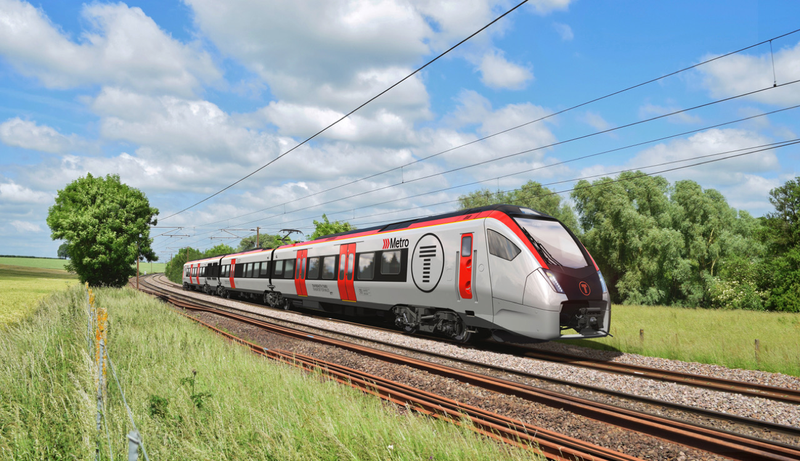 From the pictures, the trains, that will be delivered to KeolisAmey Wales, look very much like the trains, that have been ordered by Greater Anglia. The trains will operate services between Cardiff and Ebbw Vale, Maesteg and extending to Severn Tunnel Junction and beyond. I would assume that the trains will use diesel, where there is no electrification. One current service goes between Maesteg and Cheltenham Spa stations. On the South Wales Main Line between Cardiff and Seven Tunnel Junction, the trains would use the 25 KVAC overhead wires, but at both ends of the route, they would use diesel. One great advantage of bi-mode trains like these Flirts, is that as more electrification is added, they can take advantage. I’m certain, that their performance, will allow them to mix it on the South Wales Main Line with the London-Newport-Cardiff-Swansea expresses. A European version of the train will start to operate soon in the Aosta Valley in Italy, so when the trains for Wales are delivered, there will be lots of operational experience. Especially with climbing steep hills! This article on the Railway Gazette is entitled Bi-Modes In Norway’s Next Flirt Order. The bi-modes will be used around Trondheim, on routes without elewctrification. What does Norway have a lot of? Mountains! Could There Be A Bi-Mode Aventra for Commuter Routes? The London Overground has ordered a fleet of four-car Class 710 trains. The Gospel Oak to Barking Line is being extended to a new Barking Riverside station. In an article in the October 2017 Edition of Modern Railways, which is entitled Celling England By The Pound, Ian Walmsley says this in relation to trains running on the Uckfield Branch, which probably has a terrain not much different to the lines in London. The proposed Barking Riverside Extension is about a mile, so this could need up to 20 kWh each way. This could easily be done with a battery, but supposing a small diesel engine was also fitted under the floor. Would anybody notice the same 138 kW Cummins ISBe diesel engine that is used in a New Routemaster hybrid bus? I doubt it! It is revealing to calculate the kinetic energy of a fully-loaded Class 710 train. I estimate that it is around forty kWh, if it is travelling at 90 mph. That speed would rarely be achieved on the Gospel Oak to Barking Line. If a Class 710 train, had only one 75 kWh battery from a New Routemaster bus, the charge levels would be as follows, as it went to Barking Riverside and back. I have assumed that the train needs 20 kWh for the journey, but this figure will probably be lower, as the Aventra is a very efficient train. Regenerative braking is not hundred percent efficient, so that explains generating only 30 kWh. But it could be more. It would appear that the diesel engine would not need to be used. I come to the conclusion, that there is no need to electrify, the Barking Riverside Extension! The total capacity of the battery or batteries must be such, that they can handle, the maximum amount of energy that will be generated in braking. This has the following benefits. The train may not have any need to be fitted with resistors on the roof or other means to use the generated eectricity. Any electrification will not need to be given the ability to handle return currents from the train. The train will use less energy on a given trip. As an engineer, I like the concept of putting a battery in all cars with traction motors. Each battery will have shorter cables to where energy is used and created, which will cut losses. More batteries probably improves reliability. Distributing the weight might be a good thing. I would suspect that only unmotored trailer cars might not have batteries. Supposing a Class 710 train had three 75 kWh batteries. This would give a capacity of 225 kWh and the following ranges on battery against energy usage in k|Wh/per mile/per car. These figures show that an efficient train is key to a longer range. The ultimate Class 710 train might have the following. Two 75 kWh batteries per car. Energy usage of 3 kWh/per mile/per car. This would give a range of fifty miles. With a small and almost silent Cummins diesel engine from a New Routemaster, it could go as long as you wanted. Should A New Routemaster Bus Diesel Generator And Battery Be Used? There are a thousand New Routemaster buses on the streets of London, so the reliability of the power train must be known very accurately. The Cummins diesel engine and generator are very quiet and are only noticed on an empty bus, when they start and stop. The engine and generator are under the back stairs. The battery is fitted under the front stairs. The power train doesn’t appear to be large. Using these components would certainly be a good place to start and they could probably be easily fitted under the train. Would Be The Maximum Speed On Diesel Power Be The Same As On Electricity? Because the battery and the diesel generator will work together, I believe this will be possible, if there is a well-programmed computer system on the train. Accelerating to line speed of 90 mph will take around forty kWh, as that will be the energy of the train. This will perhaps take thirty seconds in which time, the 138 kW Cummins generator, will produce just over a kWh of electricity, so the battery will provide 39 kWh. The battery will be charged by electrification where it exists and regenerative braking. In addition, the diesel generator could also top up the battery. In the cruise, energy would need to be supplied to overcome aerodynamic losses, to climb gradients and provide train and passenger services. Under braking, the regenerative braking would charge the battery. You wouldn’t be able to run on a challenging line, but running on a fairly level line, which was perhaps twenty miles long with a dozen stations, would be a possibility. Range on a real route, would be increased by adding extra batteries. I suspect, Bombardier have created a sophisticated computer simulation of various train configurations and routes. In this article in Rail Magazine, which is entitled Bombardier Bi-Mode Aventra To Feature Battery Power, a company spokesman is quoted as saying. So I’m pretty certain, a bi-mode version of a Class 710 train would have a 90 mph operating speed . And for some easy routes on the similar-sized battery and diesel generator to that of a New Routemaster bus. Imagine a Class 710 train with a single 75 kWh battery and a Cummins generator. Suppose power is cut to the electrification for some reason. A normal electric train would just sit there, but the generator would cut in and using the residual energy in the battery, the train would go slowly to the next station. With just 75 kWh and an energy usage of 3 kWh/per mile/per car, the train would go six miles. The keys to a fast stop at a station or a short dwell time are down to the following. Smooth, fast deceleration under regenerative braking. Efficient loading and unloading of passengers and their baggage. Fast acceleration away from the stop to regain operating speed. Point two has nothing to do with the traction system of the train and it can be improved by good design of doors, lobbies on the train and platforms, and by better staff deployment and training. Will the traction system be designed in a similar way to that of a New Routemaster bus? The train’s traction, passenger, driving and other systems will be powered directly from the battery. The battery will be charged in one of four ways. From 25 KVAC overhead electrification. A well-programmed computer system would control the whole traction system. Fast acceleration to operating speed will probably need the onboard generator or the electrification to provide a backup to the battery. When the train stops in a station, the computer will ensure that the battery contain as much power as possible, so that a quick acceleration away is possible. A lot of power will have come from regenerative braking, but at times, the onboard generator or the electrification would be used to charge the battery. At each stop, because of the limitations of regenerative braking, a certain proportion of the electrical energy will not be recovered and stored in the battery. The onboard generator or the electrification would make up the difference. Note that the train works in the same way with an onboard generator or electrification. The proposed West London Orbital Railway will connect Hounslow and Kew Bridge stations in West London to West Hampstead and Hendon stations in North London using the Dudding Hill Line. It is around twelve miles long. It is electrified at the Western End using third-rail electrification. There is overhead electrification in the North. The middle section is not electrified. Class 710 trains, with a diesel generator and a battery stolen from a New Routemaster bus could be able to handle the routes proposed. I am led to the conclusion. that if you fitted the battery and diesel generator of a New Routemaster bus under one of the cars of a Class 710 train, you would have the following. A train capable of 90 mph on diesel and electrification. A useful range without electrification. The train would need a well-programmed computer system. The London Overground could use these trains on the Barking Riverside Extension and the West London Orbital Railway. The title of this post is the same as this article in Rail Magazine. The trains will be built at Derby. Export of trains is a possibility. Bombardier’s spokesman also said, that they have offered the train to three new franchises. East Midlands, West Coast Partnership and CrossCountry. In some ways, I am not surprised about what is said in this article. Another article on Christian Wolmar’s web site, is entitled Bombardier’s Survival Was The Right Kind Of Politics. Bombardier is not resting on its laurels. Interestingly, the company has been watching the problems over electrification and the fact that more of Hitachi’s new trains will now be bi-mode because the wires have not been put up in time. McKeon has a team looking at whether Bombardier will go into the bi-mode market: ‘The Hitachi bi-mode trains can only go 110 mph when using diesel. Based on Aventra designs, we could build one that went 125 mph. This would help Network Rail as it would not have to electrify everywhere.’ He cites East Midlands, CrossCountry and Wales as potential users of this technology. The article was published in February 2017 and mentions, 125 mph on diesel and two of the companies in the recent article. I’m pretty certain that if you wanmt to create a 125 mph bi-mode train, you start with a 125 mph electric train, if you want a high degree of commonality between the two trains. Bombardier haven’t yet built any of their Aventras for West Midland Trains, but as they will use the West Coast Main Line extensively, will they be 125 mph trains and not 110 mph trains, as is said in Wikipedia? I will believe until Bombardier say I’m wrong, that Crossrail’s Class 345 trains, which are Aventras, use batteries for the following purposes. To limp the train out of the tunnel or to the next station or safe exit point, if there should be a catastrophic power failure. To lessen the amount of electricity fed to the trains in the tunnels. To allow features like remote wake-up, which need a train to have some form of power at all times. To move trains in sidings and depots without having live electrification. To run passenger features, when the power fails. Effectively, the Class 345 trains have electricity as a main power source and batteries for energy storage and a secondary or emergency power source. I talked to one of their staff, who was training drivers on Crossrail’s Aventras. The conversation went something like this. Can anybody think of another way to have emergency power on the train? Bi-mode trains and Alstom’s hydrogen-powered Coradia iLint are electrically powered at all times. This means that under electric, diesel or hydrogen power, the traction motors can generate electricity to brake the train. On an electric train, this electricity is returned through the overhead wire or third rail to power other nearby trains. This electricity could also be stored in an onboard battery, just as it is in a hybrid or battery-electric vehicle. The bi-mode Aventra could have electricity from one of four power sources. An onboard electricity generator powered by diesel fuel or hydrogen. So will the driver need to keep switching power sources? I am a Control Engineer by training and optimising the best power to use is a typical problem for someone with my training and experience. The train’s computer would take all the information about the route, timetable, signal settings, battery charge level, train loading, weather and other factors and drive the train automatically, with the driver monitoring everything thoroughly. Aircraft have been flown in a similar fashion for decades. I look in detail, at the mathematics of a bi-mode Aventra with batteries in Mathematics Of A Bi-Mode Aventra With Batteries. I came to the following conclusions. I am rapidly coming to the conclusion, that a 125 mph bi-mode train is a practical proposition. Only one power-pack would be needed for a five-car train. For a five-car train a battery capacity of 300 kWh would probably be sufficent. From my past professional experience, I know that a computer model can be built, that would show the best onboard generator and battery sizes, and possibly a better operating strategy, for both individual routes and train operating companies. Obviously, Bombardier have better data and more sophisticated calculations than I do. Note, that everything I proposed, is well within the scope of modern engineering, so other companies like CAF and Stadler, who are actively involved in rail application of battery technology, could join the party. 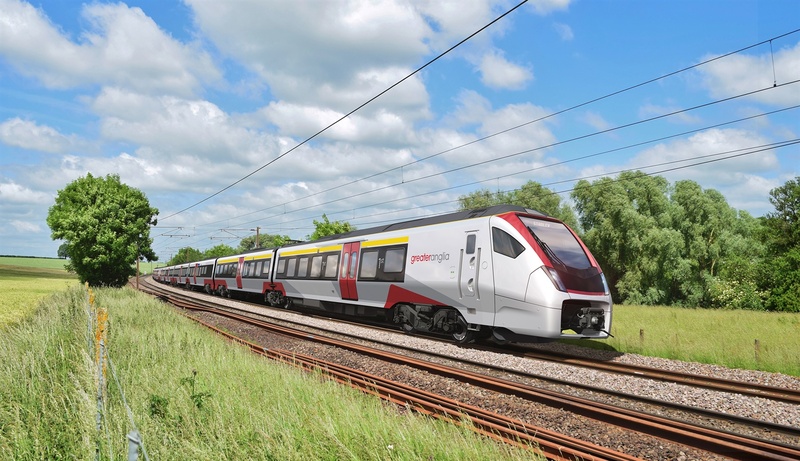 This picture is a visualisation of a Stadler Class 755 train, which they are building for Greater Anglia. Note the smaller third car, which contains the diesel engine of this hybrid train. Is there room for batteries as well? I can’t find any information on the web about the power train of the Class 755 train, but this article in the Railway Gazette, describes another Stadler bi-mode Flirt, that Stadler are building for Italy. The units will be rated at 2 600 kW with a maximum speed of 160 km/h when operating from 3 kV DC electrification, and 700 kW with a maximum speed of 140 km/h when powered by the two Stage IIIB compliant Deutz TCD 16.0 V8 diesel engines. There is provision to add up to two more cars if required to meet an increase in ridership. Two more engines could be added, or the diesel module removed if only electric operation is needed. The Deutz diesel engines are rated at 520 kW. As 700 kW is the power of the train, I suspect each engine generator creates 350 kW of power. I suspect that if batteries were used on this train, that the engines would be smaller. We will see in May 2019, when the trains enter service. 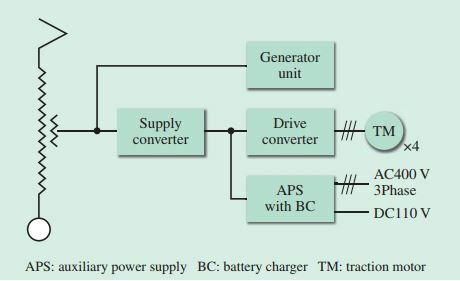 Electricity generation using a diesel generator and electricity generator from a hydrogen fuel cell, each have their own advantages. Diesel engines create a lot of noise and vibration and emit carbon dioxide, noxious gases and particulates. Hydrogen fuel cells can be silent and only emit water and steam. Ballard who are a Canadian company and a leading manufacturer of hydrogen fuel-cells, manufacture one for use in rail applications which has an output of 100 kW, that weighs 385 Kg. MTU make the diesel engine for a Class 800 train, which has an output of over 600 kW, that weighs 5000 Kg. Hydrogen storage is probably heavier and more complicated than diesel storage. Both generators can be fitted into convenient rectangular power packs. I would envisage that in the future, hydrogen electricity generators will get more efficient, lighter in weight and smaller in size for a given power output. I don’t think it is unreasonable to believe, that within a reasonable number of years, hydrogen generators and their hydrogen storage tank, will be comparable in weight and size to current diesel generators and fuel tanks. The major use of electricity on a 125 mph train, will be in accelerating the train up to line speed. The energy needed will be. Proportional to the mass of the train. This is why your car accelerates better, when it’s just you in the car and you don’t have your overweight mother-in-law in the back. Proportional to the square of the velocity. I have calculated that a five-car bi-mode Aventra, carrying 430 passengers and travelling at 125 mph, will have a kinetic energy of 91.9 kWh. Obviously, using electricity from electrification is the best way to accelerate a train. Electricity from electrification is probably cheaper and more convenient, than that from an onboard electricity generator. If diesel is not used to power the train, there is no noise and vibration from an onboard diesel generator. A route with a lot of running on onboard fuel, means more fuel has to be carried. Using electricity stored in batteries on the train, is also a good way to accelerate a train, but the batteries must have enough charge. The onboard electricity generator will be used, when there is no electrification and the power stored in the batteries is approaching a low level. |When Bombardier’s spokesman says, that the ambience will be good, control of the train’s power sources has a lot to do with it. Could he have been hinting at hydrogen, as hydrogen fuel cells do not have high noise and vibration levels? Every body continues in its state of rest or uniform motion in a straight line, unless impressed forces act on it. If you have a train on a railway track moving at a constant speed, the following forces are acting to slow the train. Aerodynamic forces, particularly on the front of the train. Rolling friction of the steel wheel on a steel rail. Bends and gradients in the track. So the driver and his control system will have to feed in power to maintain the vrequired spreed. I have sat on the platform at Stratford, whilst an Aventra has gone past at speed. I wrote about it in Class 345 Trains Really Are Quiet! Bombardier have applied world class aviation aerodynamics to these trains. Particularly in the areas of body shape, door design, car-to-car interfaces, bogies and pantographs. Remember too, that low noise means less wasted energy and greater energy efficiency. In addition steel wheel on steel rails is a very efficient way of moving heavy weights. Bombardier have a reputation for good running gear. Once a train has reached its cruising speed, appropriate amounts of power will be fed to the train to maintain speed. But compared to the power needed to accelerate the train, they could be quite small. For small amounts of power away from electrification, the control system will use battery power if it is available and can be used. The onboard electricity generator would only be switched in, when larger amounts of power are needed or the battery power is low. The regenerative braking will always be used, with the energy being stored in the batteries, if there is free capacity. A bi-mode making a stop at Leicester station on the Midland Main Line. It is doing 100 mph before the stop on the main line. It will be doing 100 mph after the stop on the main line. The energy of the train after Leicester will be roughly the same as before, unless the mass of the train has changed, by perhaps a large number of passengers leaving or joining the train. When the train brakes for Leicester this energy will be transferred to the train’s batteries, if there is capacity. On accelerating the train, it will need to acquire X kWh. It couldn’t get all of this from the batteries, as for various reasons the overall efficiency of this sort of system is about seventy to ninety percent. The onboard electricity generator will have to supply a proportion of the energy to get the train back up to 100 mph. But in a diesel train it will have to supply all the energy to get back to 100 mph. Where Would I Put The Batteries? Aventras seem to have a lot of powered-bogies, so to keep cable runs short to minimise losses and maximise the efficiency of the regenerative braking, I would put a battery in each car of the train. This would also distribute the weight evenly. Where Would I Put The Electricity Generators? Diesel engines always seem to be noisy, when they are installed under the floor of a train. I’ve travelled a lot in Bombardier’s Turbostars and although they are better than the previous generation, they are still not perfect. I’ve also travelled in the cab of a Class 43 locomotive, with a 2,250 hp diesel engine close behind me. It was very well insulated and not very noisy. As I said earlier, the most intensive use of the onboard generators will come in accelerating a train to operating speed, where no electrification or battery power is available. There is only so much you can do with insulation! Stadler, who are building the Class 755 train for Greater Anglia, have opted to put a short diesel generator car in the middle of the train. This was an earlier train, where Stadler used the technique. There are reports in Wikipedia, that the ride wasn’t good, but I’m sure Stadler has cracked it for their new 100 mph bi-mode trains. Creating a bi-mode by adding an extra motor car into the middle of an electric train could be a serious way to go. A powerful diesel engine could be fitted. Insulating passengers and staff from the noise and vibration would surely be easier. There could be a passage through the car, to allow passengers and staff to circulate. In an ideal world, a four-car electric train could be changed into a five-car bi-mode train, by adding the motor car and updating the train software. In Mathematics Of A Bi-Mode Aventra With Batteries, I came to the conclusion, that if the batteries are used in conjunction with the power-pack, that a single power-pack of about 200 kW could be sufficient to power the train. This would be smaller and lighter in weight, which would probably mean it could be tucked away under the floor and well-insulated to keep noise and vibration from passengers and staff. In this article in Global Rail News from 2011, which is entitled Bombardier’s AVENTRA – A new era in train performance, gives some details of the Aventra’s electrical systems. This is said. AVENTRA can run on both 25kV AC and 750V DC power – the high-efficiency transformers being another area where a heavier component was chosen because, in the long term, it’s cheaper to run. Pairs of cars will run off a common power bus with a converter on one car powering both. The other car can be fitted with power storage devices such as super-capacitors or Lithium-ion batteries if required. This was published six years ago, so I suspect Bombardier have refined the concept. So could it be that Bombardier have designed a secondary power car, that can be fitted with a battery and a diesel engine of appropriate size? Using a diesel engine with batteries means that a smaller engine can be used. The diesel engine could also be replaced with a 200 kW hydrogen fuel cell. I won’t speculate, but Bombardier have a very serious idea. And it’s all down to the mathematics. What Would Be The Length Of A 125 Mph Bi-Mode Aventra? Long distance Aventras, like those for Greater Anglia and West Midlands Trains, seem to be five and ten car trains. This would fit well with the offerngs from other companies, so I suspect five- and ten-cars will be the standard lengths. In an article in the October 2017 Edition of Modern Railways, which is entitled Celling England By The Pound, Ian Walmsley says this in relation to trains running on the Uckfield Branch, which probably has a terrain not much different to the lines to London. The new extension is about a mile, so this would need 20 kWh each way. This could easily be done with a battery, but supposing a small diesel engine was also fitted under the floor. Would anybody notice the same 138 kW Cummins ISBe diesel engine that is used in a New Routemaster hybrid bus? It is a revealing to calculate the kinetic energy of a fully-loaded Class 710 train. I estimate that it under 50 kWh, if it was travelling at 90 mph, which would rarely be achieved on the Gospel Oak to Barking Line. Could Bombardier Be Serious About Exporting Bi-Mode Aventras? In my opinion, the Aventra is a good train an it seems to sell well in its electric form to train operating companies in the UK. But would it sell well in overseas markets like the United States and Canada, India and Australia? They obviously know better than I do, so we should take their statements at face value. The Rail Magazine article mentions three prospective customers. I deal with them and other possiblilities in Routes For Bombardier’s 125 Mph Bi-Mode Aventra. If Bombardier build a 125 mph bi-mode Aventra with batteries, there is a large market. It looks like the company has done a lot of research. Bombardier are designing a serious train. In the March 2018 Edition of Modern Railways, there is a short news item, which is entitled Bi-Mode Study For SWR DMUs. The Class 158 and Class 159 diesel multiple units used by South Western Railway are diesel-hydraulic units. Under their franchise aggreement, South Western Railway, agreed to perform a study, to see if the multiple units could be converted from diesel-hydraulic to diesel-electric transmission. If this is successful, then the plan would be to fit a third-rail capability to the trains, so they could use the electrification between Basingstoke and Waterloo on services to Salisbury and Exeter. Could the conversion also raise the operating speed of the trains from their current 90 mph to a more timetable-friendly 100 mph? It looks like it could be a feasible , especially as the article states they might re-use redundant modern traction equipment from Class 455 trains, which are due for replacement. In The Future Of Diesel Trains, I talked about work being done in Edinburgh, by a company called Artemis Intelligent Power, to improve the efficiency of diesel-hydraulic trains. This is an extract from the original post. Artemis Intelligent Power has a page about Rail applications on their web-site. This is the introductory paragraphs to their work. Whilst electrification has enabled the de-carbonisation of much of the UK’s rail sector, the high capital costs in electrifying new lines means that much of Britain (and the world’s) railways will continue to rely on diesel. In 2010, Artemis completed a study with First ScotRail which showed that between 64 and 73 percent of a train’s energy is lost through braking and transmission. In response to this, Artemis began a number of initiatives to demonstrate the significant benefits which digital hydraulics can bring to diesel powered rail vehicles. The first is the fitting of a more efficient hydraulic unit, that is described in the Rail Technology Magazine article. Under a heading of Faster Acceleration, Reduced Consumption, there is a technical drawing with a caption of The Artemis Railcar. We are also working with JCB and Chiltern Railways on a project funded by the RSSB to reduce fuel consumption and improve engine performance by combining highly efficient hydraulic transmission with on board energy storage in the form of hydraulic accumulators, which store energy during braking for reuse during acceleration. The use of hydraulic accumulators to provide regenerative braking. The involvement of JCB, whose construction equipment features a lot of hydraulics. The involvement of Chiltern Railways, who like their parent company, Deutsche Bahn, have a lot of diesel-hydraulic multiple units and locomotives. The article goes on to detail, how a test railcar will be running before the end of 2017. I wonder if Artemis Intelligent Power have ideas for improving the efficiency and creating bi-modes of Class 158 and Class 159 trains? Could they for instance produce a highly-efficient electrically-driven hydraulic pump, that could be powered by the third-rail electrification, where it is available? If they can, the advantages of this approach include. The ability to swap from diesel to electric power as required. Regenerative braking could be made available. The trains would still use diesel-hydraulic transmission. It must surely, be at a lower cost. These pictures show the electrification works at Bromsgrove station and up and down the Lickey Incline. Nearly all the gantries seem to have been erected and much of the wiring seem to have been added. It would appear that there is every chance that Bromsgrove will be able to run an electric service on Birmingham’s Cross-City Line in May 2018. It is worthwhile to look at the options for taking electric trains onward from Bromsgrove station. The distances to and from Bromsgrove are as possible. West Midlands Trains‘ fleet of four-car diesel CAF Civity trains would handle Birmingham to Hereford with ease. Abellio, who are a partner in West Midlands Trains, have ordered Stadler bi-mode Class 755 trains for Greater Anglia. These trains are ideal for routes like Norwich to Stansted and Cambridge to Ipswich, but they would also be efficient on the Birmingham to Hereford route. So perhaps we might see bi-mode trains or trains with batteries on suburban routes from Birmingham. I doubt a battery train could go further than Worcester. Electrifying from Birmingham to Bromsgrove means that the steep Lickey Incline will be included in the works. Once the Lickey Incline is electrified, I would think it more likely that bi-mode trains could be seen on the routes to Hereford and Worcester.